For peaceful, tranquil holiday, Playa de Esquinzo ticks all the boxes. Sparkling blue waters and beautiful beaches can be found by holidaymakers exploring this attractive little resort. Because of its smaller size, it’s perfect if you're looking for a self-contained luxury beach holiday. The north of Esquinzo is where you’ll find most of the private holiday apartments and in the south, the hotel complexes dominate. 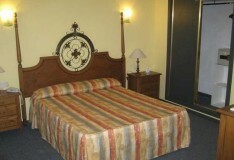 But, no matter where you stay, Esquinzo is the perfect place for relaxation. 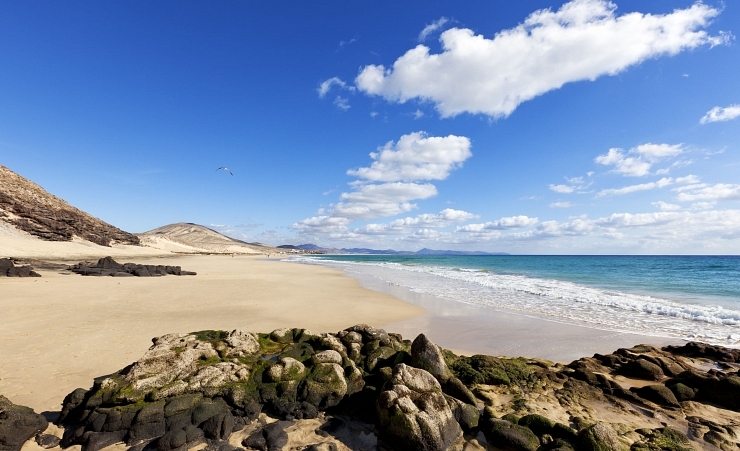 Fuerteventura weather is relatively warm for most of the year, much like the rest of the Canary Islands. Temperatures in summer reach close to 30℃ but don’t tend to drop below 20℃ in ‘winter’. Also, unlike the rest of the Canary Islands, Fuerteventura luckily avoids most of the region's rainfall. Esquinzo has no real town centre, making it much quieter than neighbouring towns. When you need to collect souvenirs from the trip, head to the shopping centres in Costa Calma for both lcal, novelty items and more mainstream brands. You can also take a day trip out of the resort and catch a ferry from Morro Jables port over to neighbouring Gran Canaria. Esquinzo is located on a 20 km stretch of sandy beach that is perfect for sunbathing, relaxing and taking part in watersports. You can also walk along the beach to neighbouring town Morro Jable. Playa de Butihondo is a famous beach among visitors staying in nearby hotels. The vast sandy area is perfect for building sand castles and sunbathing, and you’ll find chipmunks hiding in the beach slopes. Heading to the northern end of this beach means heading into the nudist territory, so expect to see people taking advantage of the hot weather and getting rid of their tanlnies. Carnival is celebrated every February in Fuerteventura, so no matter where you stay, lively celebrations will not be hard to find. It is worth noting that most of the restaurants in Esquinzo tend to only open for breakfast and dinner, so if you’re not staying at an all-inclusive hotel, visit one of the two supermarkets for lunchtime snacks or picnic supplies. Head to nearby Morro Jable to find traditional tapas bars with small plates perfect for sharing (or not). As it is such a quiet and peaceful resort, nightlife is very limited with only two bars. If you’re looking for a bit more excitement, try Morro Jable where you’ll find cocktail bars and clubs to keep you entertained all night long. To spice up your holiday in between swimming and sunbathing, why not try some surfing, a trip to nearby Jandia National Park or 18 holes at a golf course in Morro Jable? If surfing isn’t your thing, you can also try paddleboarding or you can spend your day sailing on a catamaran in the shallow and calmer waters. As Esquinzo is a small and quiet village, it is recommended that you hire a rental car for your stay so that you can explore the neighbouring towns.